Source: Gaston County Confederate Monument, Gastonia. Image courtesy of the North Carolina Department of Cultural Resources. Photograph by Tom Vincent. The monument depicts in stone a Confederate Common Soldier at parade rest, both hands resting on the barrel of his rifle. The sculpture rests atop a tall column on a tiered base, with the entire structure rising to approximately thirty-five feet. The front of the monument bears a bas-relief of the Confederate flag, waving from a broken pole. And the initials of the Confederacy -- "CSA" -- in raised lettering adorn each side of the tier above the inscribed faces. The monument was originally located on South Street in front of the 1911 Gaston county courthouse where it faced northward. It was relocated to the new county court building on Marietta Street after construction in 1998 where it was placed facing east. MacKethan, Lulie Biggs. 1947. Chapter Histories : North Carolina Division, United Daughters of the Confederacy : 1897-1947. Raleigh, N.C.: North Carolina Division, United Daughters of the Confederacy. The cornerstone was laid on August 8, 1912 with an address by Attorney General W. T. Blekett. The dedication took place on November 21, 1912. Mrs. D. A. Garrison, president of the local chapter of the United Daughters of the Confederacy, led the dedication exercises which were attended by many of the county's surviving veterans. An opening prayer was given by the Rev. Dr. J. C. Galoway of Gaston, and Mr. A. E. Wolz gave the dedication address. More than 1,000 school children stood along South street to watch the exercises. Following the dedication, the United Daughters of the Confederacy provided dinner for surviving veterans. Despite the general reluctance of the citizens of North Carolina to endorse secession and the Confederacy, Gaston County residents strongly supported the Confederate war effort and sent many men to the war along with neighboring Cleveland County. Following the war, there was strong support for the memory of the Confederacy and its meaning for the South, and Gaston County became the home of an active chapter of the Ku Klux Klan between 1868 and 1872. The monument sits facing east in front of the Gaston County Courthouse on Marietta Street. At the original location on South Street, the monument faced north. The Gaston County Courthouse is a large, modern office building. The monument sits just to the right of the entrance, in a cement circle and surrounded by seasonal plantings. The monument originally stood in front of what was then the prominent and newly constructed county courthouse on South Street. The county seat had moved from Dallas, North Carolina, the prior year. 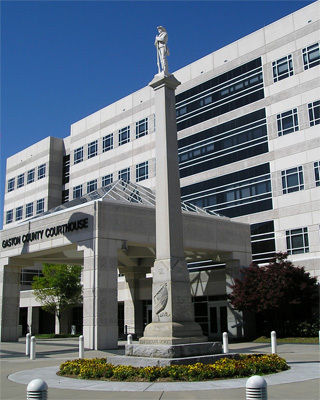 In 1998 a modern court building was built on North Marietta Street and the monument was relocated to its present location there. In many North Carolina communities, Confederate monuments continue to stand in front of historic courthouses and not their modern government counterparts. Gaston County's decision to relocate the monument to its contemporary seat of government authority speaks to importance of the monument as a living memorial to the County's Confederate heroes and history. The old courthouse became the site of Memorial Day exercises. In 1914, the Gaston County Chapter of the United Daughters of the Confederacy reported on the significance of their Memorial Day exercises at the organization's annual convention. They reported on "an impressive feature of the unusually interesting" event: the use of the United States flag, "an emblem never used heretofore." They reported that a soldier boy carried the flag into the exercises in the courtroom, accompanied by the playing of "The Star Spangled Banner," and placed it next to a Confederate veteran and flag.